Fattoush is one of my favourite Middle-Eastern dishes and is an absolutely delicious summer salad. Unlike one of my other favourite salads, Tabbouleh, the ingredients are kept roughly chopped. This was another recipe inspired by the veg box - I had radishes, which I've never really known what to do with. This is the only dish I have knowingly eaten them in, and was perfect considering the summer weather. As I rushed out to get the last of the ingredients (namely, cauliflower) my other half asked if it was strictly necessary to include cauliflower. I was insistent - it was - and he sulked. However, when it came to eating it, he declared it the best cauliflower he's ever eaten. Little victories! Preheat the oven to 180°C, then lightly toast the pitta - enough to make the pockets expand slightly. This makes them easier to slice in half. Once you've split the pitta into two halves, allow to cool. While you're waiting, make the dressing - in a bowl, crush the garlic, then add the lemon juice, olive oil, sumac, za'tar and a little salt and pepper. Whisk until all the ingredients are combined, then set aside. Your pitta should now be cool. Melt the butter in a saucepan, then using a pastry brush, brush it onto the rougher, inside part of each pitta. Place buttered side up on a baking tray then put in the oven for 15-20 minutes, until crisp and golden. Now make up the salad. Quarter the cherry tomatoes and radishes, peel the cucumber and chop into dice, and thinly slice the spring onions. Break up the cauliflower into small individual florets. Discard the thick base stem, but chop the smaller stems into chunks. Add all the ingredients to a large salad bowl then pour over the dressing and toss to distribute evenly. Roughly chop the mint, coriander and parsley, once the bread is done, add to the salad bowl and stir well. Break the bread into pieces the same size as the cauliflower and finally toss everything together before serving - eat immediately or the pitta will go soggy! 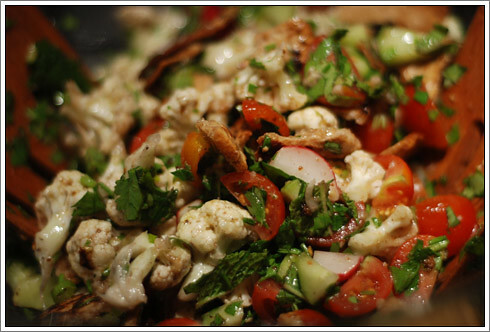 Love fattoush but have never considered to make it myself. The cauliflower would have been the first ingredient that I left out (I am with your boyfriend on cauliflower..) but I think you might have convinced me to leave it in. do try the cauliflower, it is lovely in it and tastes absolutely nothing like its cooked counterpart! if you're unsure, just cut down the quantity a bit and make sure the pieces are broken up quite small - about the same size as the radish or cherry tomato segments as this will make it seem less "cauliflower-y" - enjoy! Ooh, I just got cauliflower. Must try this! you should! it's seriously yummy! you'll be able to get the more unusual spices (sumac & za'tar) from the eda food centre down the road from you if you don't already have them - they should be pretty cheap there!